Happy new year to you all. I hope you have had a fabulous break, our weather here in the north Island has been fantastic with very little rain, if any to be honest. Tonight we bring you an exciting blog hop featuring items from the current SAB catalogue. This is the best time of the year for Stampin’ Up! as they offer free product for every $110 you spend from our current catalogues. Our lovely ladies from Creative Inkers have produced wonderful ideas featuring these items, it is always great to see how many different ways a single stamp set can be used, or in our case a few stamp sets as well as DSP, Ribbon, Buttons, Project Life and Blendabilities. And all these YOU can earn for free. A small tip about the Bow Builder Punch is to make sure you use your bone folder to curl your bow pieces. This creates a perfect round bow with no crease marks. For my second card I have used the stamp set called Lotus Blossom (139143), This stamp set is a great way to use colour and get amazing shading in your flowers with no technique. 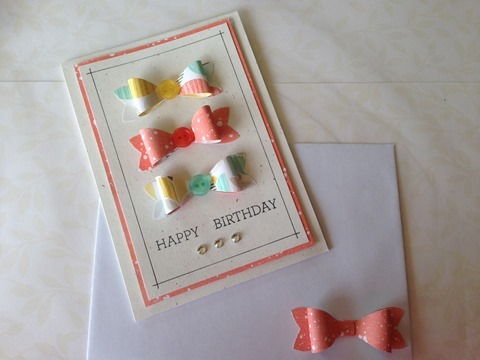 I have also used the Speciality Designer Series Paper called Irresistibly Yours SDSP. (138635) This is a neat DSP where you can add any colour to it that you want. It comes with images on the card that are clear embossed, so when you add colour the embossed images stay white. I have sponged Real Red onto my card to create a bold image. Again I have used the Bow Builder Punch at the bottom of the bunch to finish it off. Thank you for stopping by and dont forget to come back next Monday 26th January at 8pm for our Occasions Catalogue Blog Hop. Here is a list of all the talented ladies in this blog hop in case you get lost a long the way. I love how everything “pops” off your cards. These are gorgeous Narelle! Gotta love that Bow Punch aye! 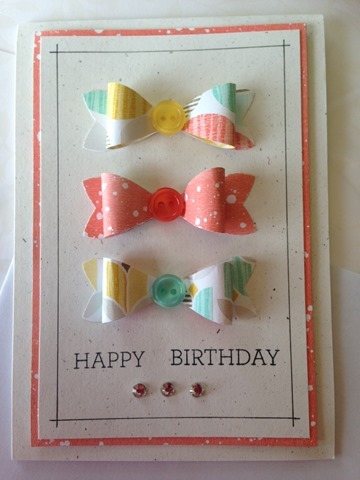 I like the way you’ve used the buttons in the middle of the bows. However I have to say I love your Lotus Blossom card – that Irresistibly Yours dsp coloured so boldly behind looks fantastic with it. What colours have you used to stamp your flowers? Great cards. 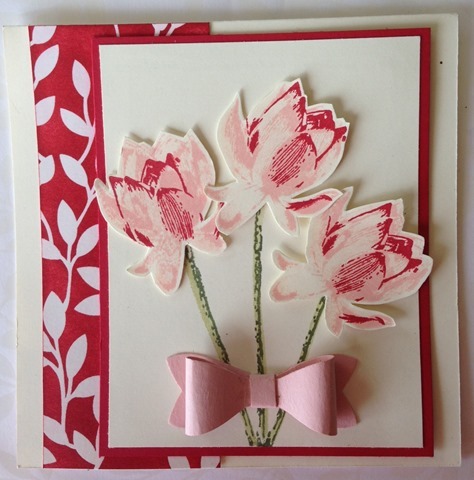 I love the versatility of the Irresistibly Yours DSP and it looks great with the Lotus stamp set.